As you've likely gathered from our Tony Beat docu-series, Tony-centric Culturalist Challenges and extra-starry photo galleries, Broadway's biggest night is getting closer! 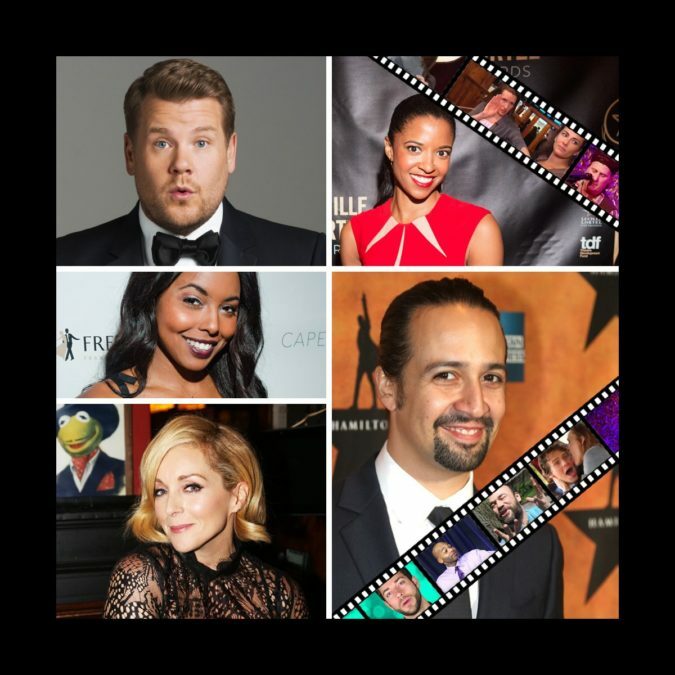 From the press days to the evening galas, we have been getting to know the 2016 Tony nominees in a whole new way. Lucky for us, we've been tight with the noms for quite some time now, and we have so enjoyed the backstage tours, fun facts and fart jokes they have bestowed upon us. So why not take a stroll an Internet spiral down memory lane? Remember Lin-Manuel Miranda's pre-Hamilton hair, or when Laura Benanti's magical meal at Hooters? Want to know how this year's Tony host James Corden dealt with being in the nominee hot seat four years ago? Keep reading! Before he was a ten-dollar Founding Father, Lin-Manuel Miranda took fans on a backstage tour of the In the Heights at the Richard Rodgers circa 2011. Oh no, here goes Mr. Braggadocio! Yep, Miranda was still boasting about his mad claw machine skills even then. What could be better than sassy She Loves Me songbird Laura Benanti with a heaping side of Groffsauce? Throw in Tony winner Sutton Foster, and you've got nine minutes of Side by Side goodness. Before Tony nominee Brandon Victor Dixon was tapping it out in Shuffle Along, he played music legend Berry Gordy in Motown. Watch him talk about battling Gordy on the tennis court and his perfectly shaped head. Yes, you read that correctly. She Loves Me's Jane Krakowski has always been a whole lot of fun. In her 2011 Ask a Star, she discusses sitting on Derek Jeter’s lap and successfully not peeing her pants when she won her Tony for Nine as well as wearing a fat suit and roller skating on 30 Rock. When he isn't giving a super intense stage performance in Blackbird, Jeff Daniels likes to jam out. The 2016 Tony nominee is no stranger to the 54 Below circuit—or getting shot by Clint Eastwood. Before Tony nominee Zachary Levi was totally charming in She Loves Me, he made his equally charming Broadway debut in First Date. Look out, ladies: this one loves Snuggies and does a killer Forrest Gump impression. Tony nominee Adrienne Warren didn't become a Shuffle Along tap queen without nailing cheers and tumbles. In 2012, the then-Broadway newbie showed us her dressing room digs for Bring It On The Musical. Comfy! Fiddler on the Roof Tony nominee Danny Burstein and Susan Blackwell wax poetic on farts, secret tattoos and Stephen Sondheim hang-out sessions. Get into it! Before playing Angelica Schuyler in Hamilton, Tony nominee Renee Elise Goldsberry found herself in the '70s, showing off her golden pipes as a pop star at a crossroads in Encores! Off-Center series' I'm Getting My Act Together and Taking It on the Road. Werk indeed! Before James Corden took home a Tony Award for One Man, Two Guvnors, hosted CBS' The Late Late Show and signed on to host Broadway's biggest night in 2016, he was just another adorable nominee. Watch him confess how starstruck he can be and then catch him hosting the Tony telecast on June 12. Happy Throwback Thursday, everyone!